There is so much misunderstanding regarding treaties, the doctrines of the necessary and proper clause, and the general welfare clause, that when you aggregate this misunderstanding our government is able to reach magnificent proportions of corruption and unconstitutional activity. Our founders were very clear and its time we listen to them instead of Congressmen and Judges who have had no training on the true meaning of the Constitution. "The powers delegated by the proposed Constitution to the federal government are few and defined… (and) will be exercised principally on external objects, as war, peace, negotiation, and foreign commerce; with which last the power of taxation will, for the most part, be connected. Our federal government was designed to be our national representative to the foreign world; a representative of the country in foreign relations. Because we lived in a world where nations where led by Kings, Czars, and Emperors, we needed to have a way that all the states could have a unified voice for negotiations and commerce. During the Articles of Confederation, our federal government could not collect taxes or even compel the delegates to show up to work and do their job. The federal government was attempting to make agreements with foreign nations and was defaulting on these agreements because they had no authority to enforce them equally throughout the states and the states themselves were suffering the greatest consequences. As reported in The Address and Reasons of Dissent of the Minority of the Convention of Pennsylvania to their Constituents, written December 12, 1787, this very point was addressed. "It was found that our national character was sinking in the opinion of foreign nations. The Congress could make treaties of commerce, but could not enforce the observance of them. We were suffering from the restrictions of foreign nations, who had shackled our commerce, while we were unable to retaliate: and all now agreed that it would be advantageous to the union to enlarge the powers of Congress; that they should be enabled in the amplest manner to regulate commerce, and to lay and collect duties on the imports throughout the United States." So, why were treaties given "supremacy" ? The collective decision was made to not only delegate the power of treaties to the President and Senate but to also classify its relevance in enforcement to the states. There was great debate over this issue, as many were concerned that by designating this power, it would elevate the treaties above the very Constitution itself. Fortunate for us, this argument was made, because the rebuttal to this argument is vital in understanding the limitations and scope of treaties. Without these explanations, treaties created by the federal government might justifiably supersede the Constitution. Good thing for us that these treaties, although they may attempt to supplant the Constitution, they are plainly not justified in doing so. Our founders repeatedly stated that treaties were, for every purpose and application, CONTRACTS, agreements with foreign nations to accomplish the duties obligated in those four delegated powers Madison identified. Although these Contracts were not considered to be a subdivision of laws or even new laws altogether, it was necessary that they were binding upon the states to prevent the failures seen by our founders in the Articles of Confederation. These treaties were not designed to be untouchable. They were subject to the very same checks and balances of every act of the federal government. They could fail if they didn't meet the proper standards. One way they could fail is if they attempted to infringe upon or utilize a power that had not been granted to them through the Constitution. They were to be bound and fettered by all the limitations of power inherent in the Constitution through the specific delegated powers and the necessary and proper and general welfare clauses. To us, that statement must sound like an oxymoron; to think that the necessary and proper and general welfare clauses were meant to bind Congress. Because we have become so detached from the founders intent, we have allowed these clauses to become an expansion of power, a consequence that our founders thought an abomination. [The explanation of these clauses are a whole other analysis, but for a complete explanation of the intent of the General Welfare Clause, please read my previously written analysis. I promise you will be shocked at the clarity of our foundersâ€™ intent.] So, if a treaty attempted to assume a power that was not previously delegated, for instance to bind upon the states agreement for an object outside of the realm of war, peace, or foreign commerce, it would be deemed unconstitutional. "I insisted that in givg to the Prest. & Senate a power to make treaties, the constn meant only to authorize them to carry into effect by way of treaty any powers they might constitutionally exercise." – Thomas Jefferson: The Anas, 1793. "By the general power to make treaties, the constitution must have intended to comprehend only those subjects which are usually regulated by treaty, and cannot be otherwise regulated… It must have meant to except out of these the rights reserved to the states; for surely the President and Senate cannot do by treaty what the whole government is interdicted from doing in any way." – Thomas Jefferson: Parliamentary Manual, 1800. Another limitation imposed by our founders on treaties is that they MUST NOT be in conflict with the Constitution. If a treaty is in direct conflict with, letâ€™s say the Second Amendment, that treaty would be considered unconstitutional. 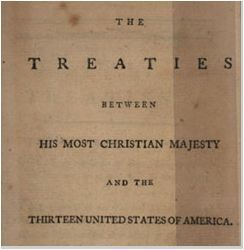 Treaties were established as a supreme law to maintain the credibility and honor of an agreement with a foreign nation, but it was NEVER supposed to be superior to the Constitution. There is no law superior to the Constitution. But what are we to do when these treaties fail the tests of Constitutional limitations? I have heard it mentioned that we are stuck with these treaties short of another treaty supplanting them or a Constitutional Amendment. This perspective is not consistent with our foundersâ€™ explanations. As a matter of fact, our founders wanted us to know that if a treaty was in opposition to the Constitution, there were significant consequences. Every day our federal government seems to operate more and more under the assumption that their power is derived in the manner of a Kingdom, it is essential that the people, from which its true power is derived, stand against this tyranny and restore the balance of power. We cannot do this unless we first understand the exceptional principles under which this nation was established. We cannot do this unless we REQUIRE our representatives to operate under these principles.